PlayTM Sports is incomplete without a sport that gets maximum participation in Bangalore - Oh Yes! 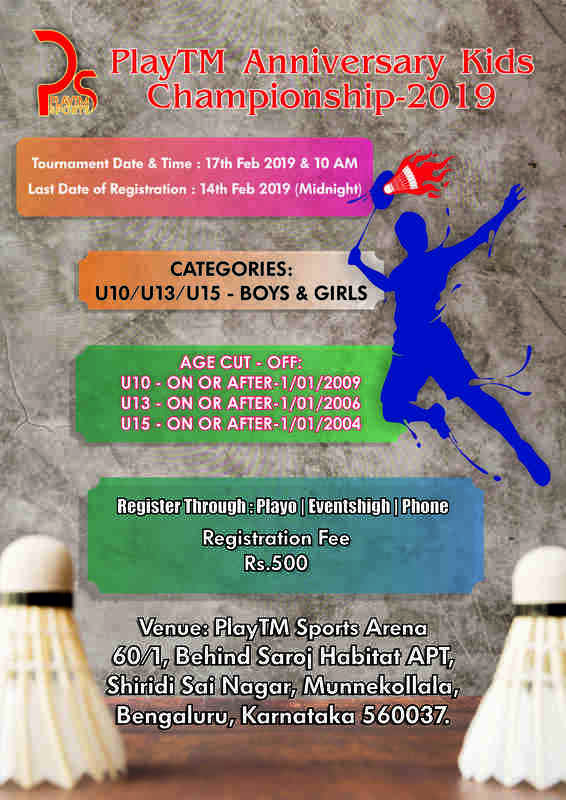 We are talking about PlayTM Anniversary Kids Championship-2019. -Nylon shuttlecock Yonex Mavis 350 will be used for all the matches. -Any valid Age proof ( Birth Certificate or Aadhar card) submission is mandatory before 30 min of reporting time i.e. 9:00 AM on 17 th Feb 2019. -The fixture will be created by the organizing team and communicated to participants one day in advance over registered email. Once published will not be changed on individual request. The fixture will be based on the seeding given by the organizing team. To save time for everyone exact time for each match will be given and players are requested to reach the venue on time. The late arrival of players leads to automatic walkover for the opponent. -Player found not to be fit in the kid's category because of various reason, can be removed from the tournament at any point of time without giving any reason. -Umpire/Referee decision will be final and players are requested to cooperate. -Players are participating at their own risk. Any injuries or accidents occurring during the event are not the responsibility of the organizers. -Players should strictly wear Non-Marking Shoes and come in sports attire. -Registration cannot be canceled in any circumstances and money will not be refunded. -Tournament Committee will have the authority to postpone/cancel/amend the schedule of the tournament at any given point of time but with prior notice to the respective teams. In such cancellation, the full amount will be refunded.